Rock Island’s Brea Beal battles for a rebound with Moline’s Cierra McNamee (43) and Megan Pittington (34) during a Class 4A regional game at Rock Island High School. Beal was named Class 4A first team all-state for the third consecutive season. 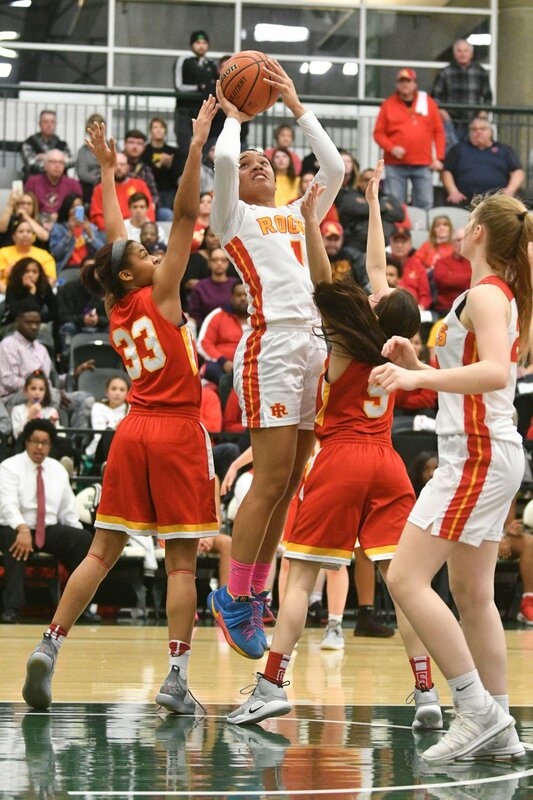 Rock Island senior Brea Beal (center) gets off a shot on the Chicago Mother McAuley defense in a 66-48 season-ending setback for the Rocks in the Class 4A Illinois Wesleyan Super-Sectional Monday at Illinois Wesleyan's Shirk Center in Bloomington. Rock Island's Brea Beal took another significant step Thursday toward joining WNBA great Candace Parker as the only three-time Illinois Ms. Basketball winners. The Western Big Six Conference's all-time leading scorer was named first-team All-State for the third straight year by the Illinois Associated Press. In statewide voting by sportswriters and broadcasters, Beal was the top Class 4A vote-getter for the third time, too, and was a repeat unanimous selection by being named to the first team on all 22 ballots cast. The only time Beal failed to make the AP's elite five-player first team was her freshman year, when she settled for second-team honors as the seventh-highest vote-getter behind six seniors in the state's largest class. The 34th annual Ms. Basketball award, which recognizes the state's best player, is announced later this month. Beal already is in select company as one of five repeat winners of the prestigious honor. The 6-foot-1 senior swing player also is the state's two-time defending Gatorade Player of the Year. Beal averaged 24.2 points, 13.5 rebounds, 5.4 assists, 2.6 steals and 3.1 blocks this season for a 30-2 Elite Eight qualifier. Signed with national college power South Carolina, Beal's final prep season included 775 points, 431 rebounds and a career-high 40-point game. Ranked 13th nationally among senior recruits, Beal also was among 24 girls chosen nationally to play in the McDonald's All-American game later this month. Among her career numbers are 2,709 points, 1,306 rebounds and a 114-15 record, which includes a perfect home court mark and the first 40-0, four-title run in Big Six history. Joining Beal on the 4A first team are a pair of seniors in this weekend's state final four (Maine West's St. Louis-signed Rachel Kent and Rockton Hononegah's Jordan King), DePaul-committed Darrione Rogers of Lake Park, and a fellow major-college recruited junior in Taylor Gugliuzza of Lincoln-Way West. The top vote-getter in 3A, Iowa-recruited Kankakee junior Ambranette Storr, fell short of joining Beal in receiving unanimous first-team support. Besides high-scoring Charleston sophomore Shae Littleford, the other 3A first teamers are all Division I college signed seniors — Morton's Butler-bound Tenley Dowell, Marquette-inked Camryn Taylor of Peoria Richwoods, and Glenbard South's Drake-recruited Maggie Bair. The 3A second team includes a pair of this weekend's state finalists in LaGrange Nazareth senior Annie Stritzel and Morton junior Lindsey Dullard. Also making that five-player cut are three other juniors — Hillcrest's high-scoring Trinity Duckworth, Carterville leader Jeniah Thompson and major-college recruited Jaida McCloud of Peoria Richwoods. In all, 50 players were recognized by the AP in the state's largest classes, including several Division I recruits on the 30-player honorable mention lists. The Dispatch-Argus-QCOnline participates in the nominating and voting process.